Nick KE0ATH Spinnin' the dial! It has been way to long since I have posted here on the blog, and really I have done very little operating! This past weekend was the CQ World Wide WPX SSB contest. 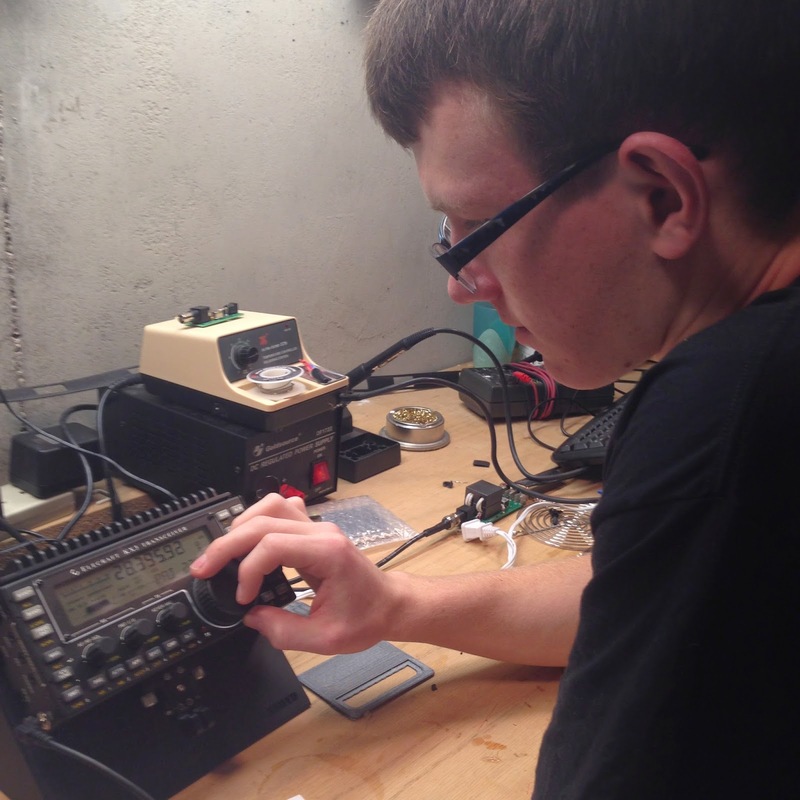 My son Nick, KE0ATH has been trying off and on to make some contacts on 10 meters since he is a Tech. I thought this contest would be great for him, so we carved out about 45 minutes on Sunday to get on the air. We ended up working exclusively into South America. Nick would give them a call, and when he was successful I would give them a call. Great fun! We have the KX3 set at 12 watts into my 66" dipole fed with ladder line. Tunes up great. If you look at the picture of the rig, you can see the stand that Nick 3D printed for me to hold the KX3. He designed it in Autodesk Inventor and printed it - it also has my call sign inlayed into it in the lower right hand corner. It works perfectly! We worked everyone that we called as well. It was great fun, and Nick had a blast working his first HF contacts! Plus I picked up several new DXCC entities for myself! I saw your post on Tony Milluzzi, KD8RTT "My Multiband Wire Vertical Antenna"
And I would suggest that you try that antenna it may lower your noise level.. It's easy to construct that antenna. I build one when I lived in a mobile home park (NO OUTSIDE ANTENNAS). It worked and they could not see it. I used 9 radials and 1 attached to the frame of the mobile home. And it work well! I was able to work Australia my first contact on 40m. If you want a copy of that article I could send it to you. Shawn - thanks for the comment. I would like to see that article if you have a copy you could send me. I will email you just in case you don't see this comment. Found another antenna design that may help with noise problem. Just getting the antenna open feed line will help with the noise. The house with all the electronics, computers ect. Should help. This site could give you more ideas too. Vertical are best for DX!